Wits’ SRC president, Mcebo Dlamini caused controversy this weekend after he posted a Facebook status regarding whites and the state of Israel: “I love Adolf Hitler”. Following his Facebook comments, he told Wits Vuvuzela that he admired the German leader, who sent millions to death camps, for his “charisma” and “organisational skills”. 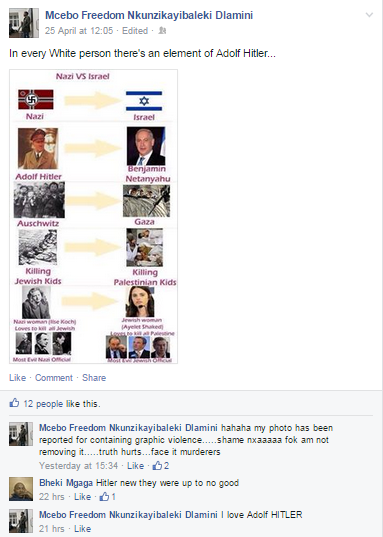 Mcebo Dlamini, Wits Student Representative Council (SRC) president, posted the statement “I love Adolf Hitler” in a comment thread below a graphic comparing modern Israel to Nazi Germany. Responding to a commenter who wrote “Hitler new [sic] they were up to no good”, Dlamini replied “I love Adolf HITLER”. When contacted about his comments on Hitler, Dlamini restated his admiration of the fascist leader of Nazi Germany. “What I love about Hitler is his charisma and his capabilities to organise people. We need more leaders of such cailbre. I love Adolf Hitler,” Dlamini told Wits Vuvuzela. As the leader of Germany, Hitler is generally blamed for triggering World War II and sending over 6-million Jews to death camps as well as Roma, communists and homosexuals. “I have researched about president Adolf Hitler. I have read books about president Adolf Hitler. I have watched documentaries about president Adolf Hitler,” Dlamini told Wits Vuvuzela defending his knowledge of the former German dictator. In the same comment thread, Dlamini wrote that every white person has “an element of Adolf Hitler”. “I have had numerous encounters with with white chaps. From primary till today I live with white chaps … As I said, they are not Hitler but there is an elements of him in all of them. I connected the dots,” Dlamini said. Dlamini further defended his remarks and suggested that his love of Hitler had “nothing do to with white people”. Dlamini told Wits Vuvuzela that “I will write what I like on my Facebook” and was not on the social media platform to “nurse Jewish people’s feelings”. “Who told them they deserve special treatment? This is an academic space, we must debate issues not to silence individuals,” he said. “I LOVE HITLER”: a screen grab of SRC president Mcebo Dlamini’s Facebook post which declares his “love” of Adolf Hitler. Photo: Facebook.